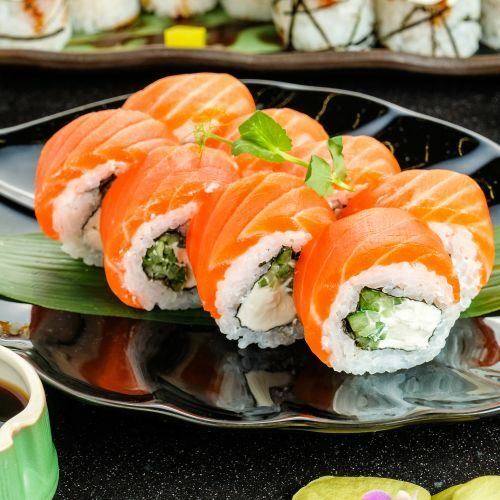 Menulog delivers for Sushi OH-OO so you'll be able to track your courier on a map. Boiled soy bean in pod. Deep-fried slice lotus root chips. Croquette with potato, crab and cream. House-made dumpling deep-fried pork and veggie. House-made dumpling steamed pork, prawn and veggie. House-made dumpling pan fried pork and veggie. Deep-fried silken tofu in sweet soy. Chicken sticks grilled with teriyaki sauce. Char-grilled Baby Broccolini with sesame dressing on iron pan. 40 pieces Medium Roll and 24 pieces Baby Roll. 18 pieces Baby Roll, 16 pieces Medium Roll, 10 pices Nigri and 20 pieces Sashimi. 16 pieces Medium Roll, 20 pieces Nigri and 20 Sashimi. 6 pieces mixed sashimi, mixed tempura added to standard bento box. 6 pieces Nigiri and 2 pices Roll. 4 pieces Nigiri and 2 pices Rolls. Full portion Karaage, 4 pieces Nigiri and 2 pieces Rolls. 1 piece King Prawn, 2 pieces veggie, 4 pieces Nigiri and 2 pieces Roll. All meals served with rice and salad. Tofu, mixed veggie with teriyaki sauce, stir-fried. Thigh fillet, mixed veggie with teriyaki sauce, stir-fried. Scotch filled, mixed veggie with teriyaki sauce, stir-fried. 3 pieces salmon, mixed veggie with teriyaki sauce, stir-fried. Deep-fried bread crumbed chicken breast fillet. Deep-fried bread crumed pork loin fillet. Pan-fried hard tofu with lemon teriyaki sauce. Scotch fillet, onion, mushroom in thick demi-glace with miso soup. All Donburi served with a miso soup. Small = 7 Pieces, Medium = 14 Pieces, Large = 23 Pieces, Deluxe = 35 Pieces and Special = 50 Pieces. 6 pieces mixed Sashimi, 6 pieces Nigiri and 2 pieces Rolls. 10 pieces mixed Sashimi, 1 piece Oyster, 8 pieces Nigiri and 2 pieces Rolls. Small = 8 Pieces Nigiri and 2 Pieces Rolls, Medium = 10 Pieces Nigiri and 2 Pieces Rolls and Large = 13 Pieces Nigiri and 2 Pieces Rolls. Green salad, silken tofu with apple dressing. Green salad, avocado with apple dressing. Green salad, 2 pieces soft shell crabs with apple dressing. Green salad, 7 pieces salmon sashimi with apple dressing. Green salad, 7 pieces mixed sashimi with apple dressing. Veggie cooked in noodle soup. Scotch fillet cooked in noodle soup. Deep-fried bread crumbed chicken breast on noodle soup. Mixed seafood cooked in noodle soup. 1 piece king prawn, 2 pieces veggie tempura served separately. 1 piece king prawn, 1 piece crab craw, blue swimmer mixed seafood in noodle soup. 2 pieces King Prawns and 5 pieces Veggie. 17 pieces mixed deep-fried selection with 3 types of sauces.